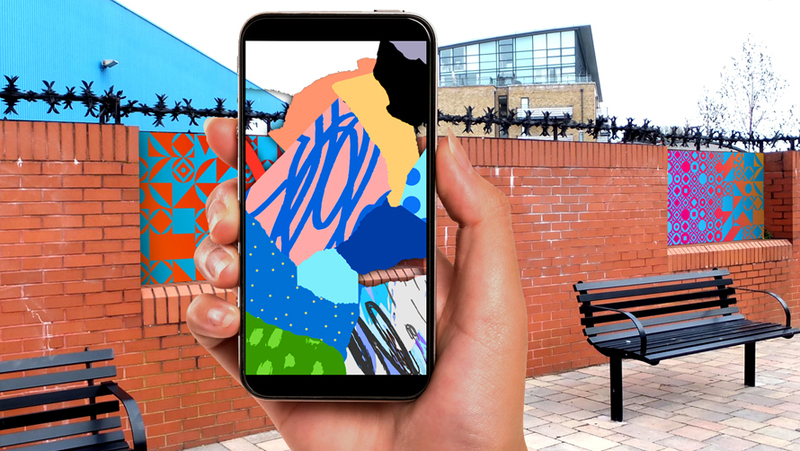 We have just begun a crowdfunding campaign to help raise funding for an exciting public art installation that we will be launching later in the year, combining physical environmental graphics and augmented reality artworks. On the one hand, it’s a 150 metre mural applied in 30 panels to the outer wall of the Heidelberg building, on the riverbank in Brentford. And on the other hand, it is a unique exhibition of 30 individual digital artworks, visible on smartphones & other devices via augmented reality technology. 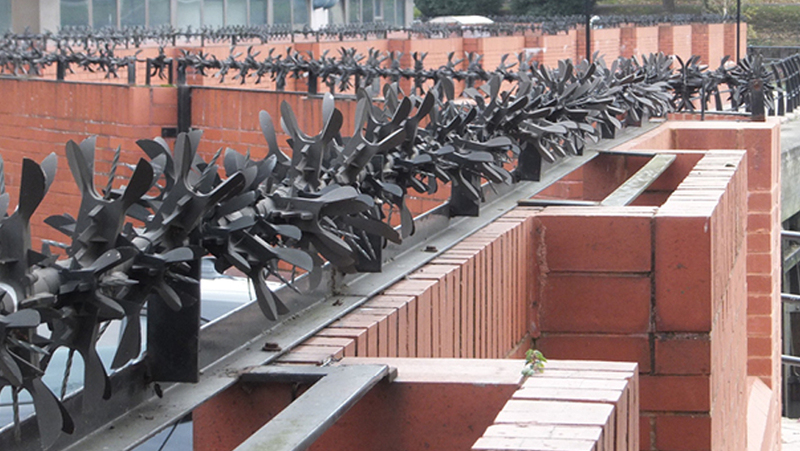 The wall around the Heidelberg showroom has been built with 30 recesses along its length. For the physical element of this project we will design a mural, which will be a single image split across 30 sections. Each section will be produced offsite as a weatherproof panel, which will then be fixed into the recesses post-production. When a visitor looks at the wall with their naked eye, they will see the mural in all its’ glory. When they download our free-to-download custom app and view the mural through their phone or tablet, each mural panel will morph into a secondary artwork emerging from the wall. Artists working in digital media will be given an opportunity to enter existing or bespoke artworks to the exhibition. The artists will be given free creative reign within the exhibition’s theme. Visuals of the mural and AR artwork use placeholder images to represent the concept only, not the design. We are in discussion with a number of well established digital exhibition curators to help to put the inaugural exhibition together. There will be 30 panels, therefore 30 individual digital artworks to display. 20 of these artworks will be allocated to works by established artists. The remainder of the panels will display artworks by local artists and students of schools and colleges who will benefit from exposure and association with the more established names. The site is on the Thames path (part of the National Trails network). The Thames Path has been described by Lonely Planet as ”among the finest urban walks on Earth”. The River Brent Mural would occupy a stretch of wall bordering that path less than 150 metres from the mouth of the Brent as it meets the Thames, overlooking the beautiful Kew Gardens. 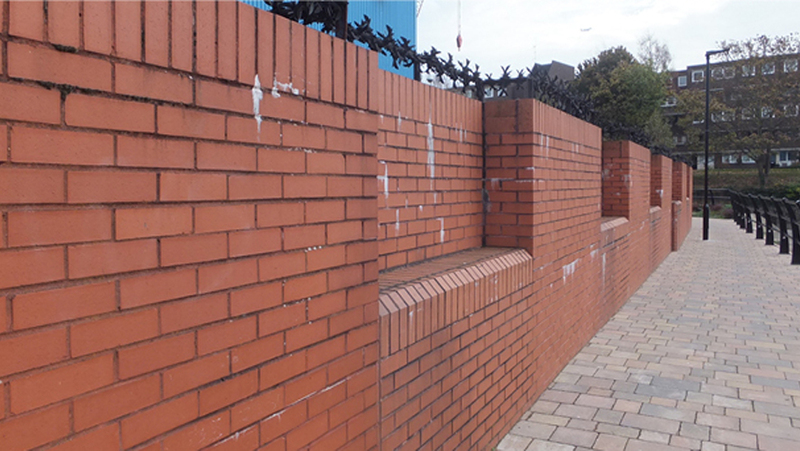 The wall itself marks the boundary of the Heidelberg European headquarters building, which has its smart main entrance on the Brentford High Street. 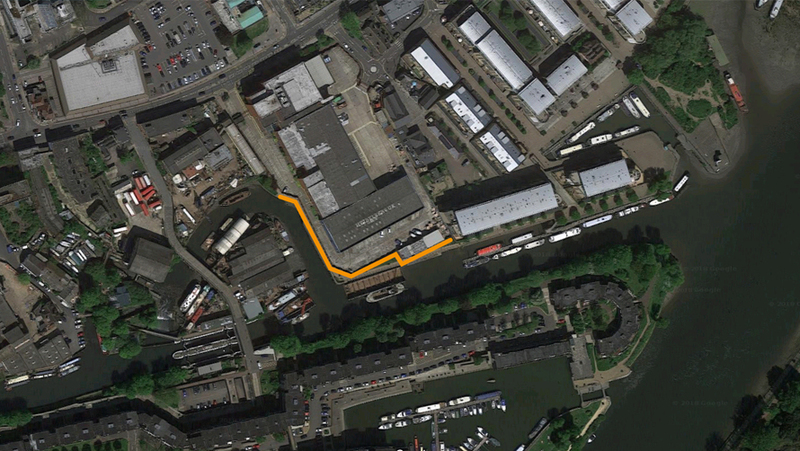 However, where the building turns its back to the river the visual impact is quite different. 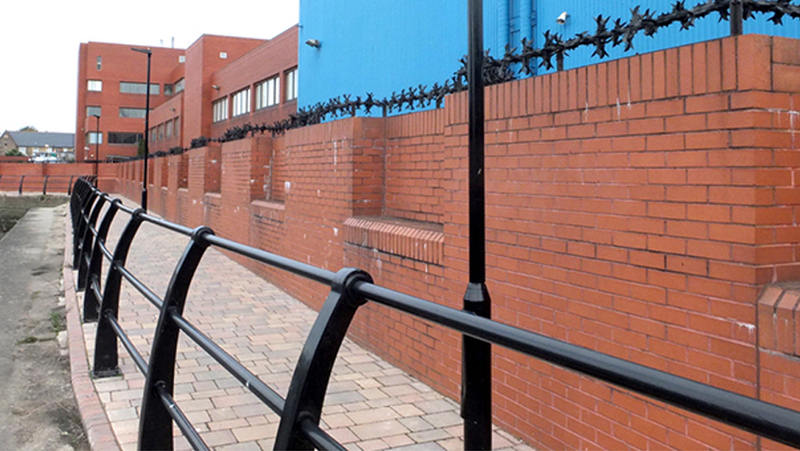 An imposing red brick wall and security fencing create a barrier along the Thames path, so the building resembles a high security detention centre or prison wall rather than high tech commercial showroom. 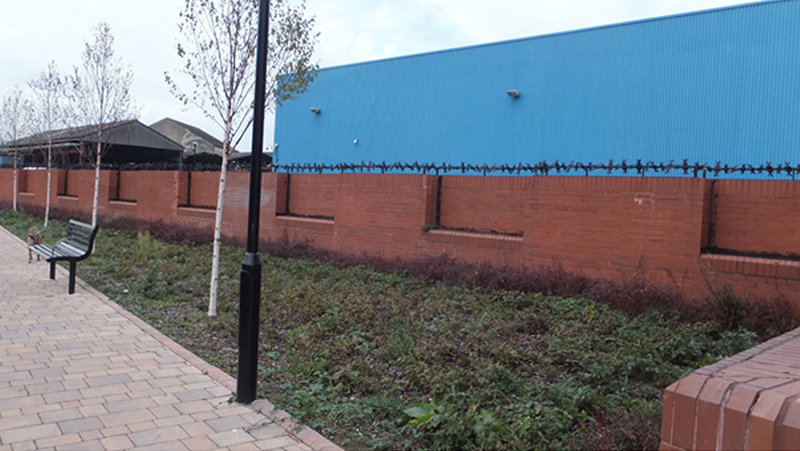 Across the river from the wall is the Brentford Dock development, whose residents overlook the wall. Adjacent to the wall is the Ferry Quays estate with over 400 residents who walk past it on a daily basis, and a number of permanent houseboat moorings. In addition, Ballymore developments are currently building almost 900 new homes, along with retail and leisure units, many of which which will also overlook the new mural. Then there are the walkers on the Thames Path trail, and the many boats which pass through Thames Lock, which connects the River Thames to the Grand Union Canal. Brentford itself has always been a notable creative area, with many artists working in studios, workshops and galleries across the area. The Heidelberg site sits between the nearby Watermans Arts Centre and the Johnson Island artists community. Developing this innovative exhibition opportunity here will further enhance Brentford’s standing as a primary West London cultural hub. 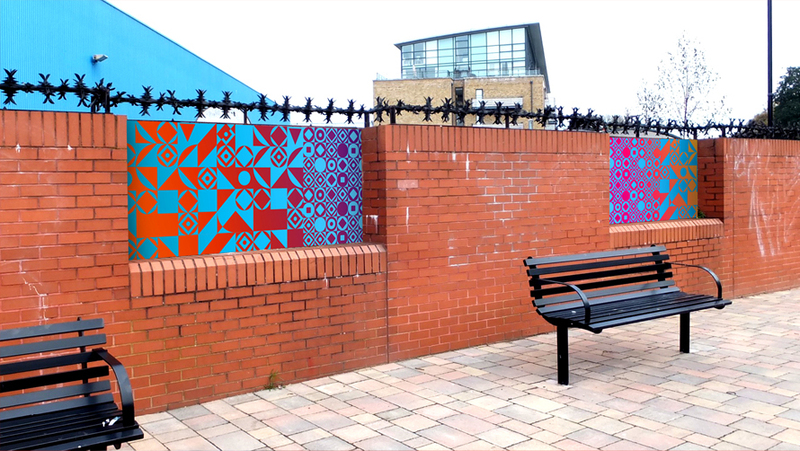 In addition to local Brentford residents and businesses who will see the mural on a daily basis, we believe that the digital art trail will become a unique addition to the London art map, appealing to a wide range of visitors. The digital gallery will offer a great opportunity for schools to introduce their students to contemporary art in an interactive and engaging format that is relevant to their lives, and will encourage school visits from across London. Art students, practising artists and art lovers will also be drawn to visit the gallery – and renewing the digital exhibitions regularly (just like traditional art galleries) will ensure repeat visits. More visitors will boost trade for local businesses, particularly bars, pubs, cafés and restaurants. We will also encourage promotions and collaborations with other local artists and galleries, which will offer additional exposure for them. Businesses based in the area will be invited to contribute to funding the project and/or sponsoring exhibitions, and will enjoy the publicity and PR benefits that will go with that. Corporate naming rights to the art trail could be available as part of a sponsorship deal. Established artists practising in the digital art world will be approached through a Limited Competition and invitation to exhibit, and place an Open Call Competition announcement in online platforms and forums. A second open call will be offered to colleges and schools with an invitation to exhibit in the remaining panels. The successful respondents will be given a promotions and publicity-based rewards package.